A cultivar of Dendranthema x grandiflorum Kitam. Ranunculus flowered chrysanthemum. This is probably the flower listed as White Indian in the Floricultural Cabinet. Ranunculus flowered. ‘Shorter than the preceding, with very late and similar, but white flowers.’ [FC p.73/1833]. It may be identical with the Superb White figured in the Botanical Register. ‘Since the two varieties were figured in the fourth plate of the first volume of the Botanical Register, some fresh importations have added others to the number already known of this ornamental species, amongst which is the one now represented, which came from China in 1817. The drawing was made from a plant that flowered in the autumn of 1818 in the nursery of Messrs. Colville, in the King's Road, Chelsea. 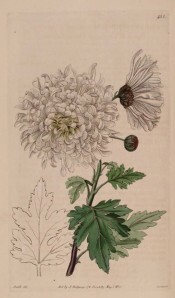 "Although the colours into which the flowers of this species sport in China are many, yet it has so happened, that of the twelve varieties which are now established in this country, four are white: of these the plant represented in the annexed plate is by far the finest, the terminating flower of the corymb being frequently near four inches in diameter. The inflected direction of the florets sufficiently distinguishes this from the others. The tubular part of each floret enlarges towards the lip, which does not expand as in several others, but assumes a hollow shape in consequence of the contraction of its edges and apex.’ [BR f.455/1820]. Listed in the 1845, 1850 and 1857 catalogues [H.61/1845].